Microgaming Keno Guide & Review - Casino Answers! Microgaming Keno is an online keno game developed by the premiere casino software company, Microgaming. The keno board consists of 80 numbers. It is available to play at any online casinos that license Microgaming software although it of course depends on whether they license this game or not. The casino that we recommend the most for people looking to play Microgaming software games is VideoSlots.com. They actually offer casino games from over 40 different software companies – one of which is Microgaming. It’s pretty cool and worth checking out as you will hopefully find Microgaming Keno there as well as a ton of other variants of Keno. 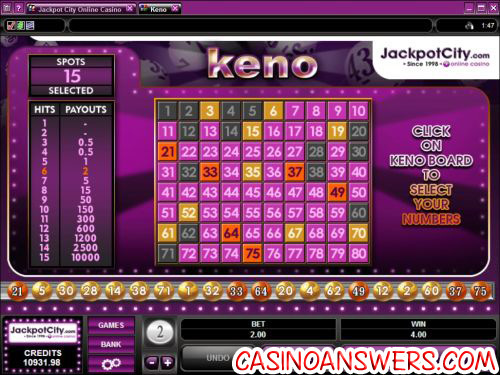 As for the Microgaming version – Microgaming’s version of Online Keno is a 80-number keno board. The paytable is at the left, the keno board in the center and the keno balls below. The keno balls are all in gold, except when they are hits. To play Microgaming Keno, you must first select a bet. Available bets are $1, $2, $5 and $10. You can then pick your numbers. Microgaming Keno does not offer a random quick pick feature, so you must select your numbers randomly. You can select from 1 to 15 numbers. You can only play one round at a time. Once you have picked your numbers out, hit the “Play” button and 20 keno balls will roll down. If you win on Microgaming Keno, the amount you have won will be shown next to your bet amount and above the “Play” button. Your winnings will be credited to your casino account. When you get a hit, the ball will be orange. Balls that aren’t hits will be gold. The balls that you didn’t select will also show up on the keno board in a shade of dark gray. Hits will be represented by the colour orange on the board. Numbers that you picked but missed will be shown as gold on the keno board. If you wish to clear your numbers and start a fresh keno board, hit the “Clear” button. If you have made a mistake clearing numbers or have pressed the wrong one, hit the “Undo” button. Payouts using all 15 numbers on Microgaming Keno are (in parenthesis): 3-4 numbers (0.5), 5 numbers (1), 6 numbers (2), 7 numbers (5), 8 numbers (15), 9 numbers (50), 10 numbers (150), 11 numbers (300), 12 numbers (600), 13 numbers (1200), 14 numbers (2500) and 15 numbers (10,000). Payouts will vary depending on how many numbers you play. Microgaming Keno is an easy play game of online keno. Unfortunately, it is missing a few of the key features that you can find on the other online casino platforms, but it is still a fun game to play a few rounds of. Can US players play Online Keno at Microgaming casinos? Microgaming casinos do not allow US players to sign up and deposit. Can I play Microgaming Keno in my web browser using Flash? Yes, The recommended casino here is VideoSlots.com and their game is completely web based. Where can I play Online Keno on my mobile phone? Check out VideoSlots.com who offer a responsive website with a variety of games you can play on your mobile phone. Keno review? Microgaming Keno Review? Can I play Keno online? Keno game review?